Politician. Republican. Born: February 12, 1834, Westbrook, Maine. Died: March 14, 1909, San Antonio, Texas. Served in U.S. House of Representatives, at-large and First District: March 4, 1883, to March 3, 1891. Served as 13th Governor of Kansas: January 14, 1895, to January 11, 1897. 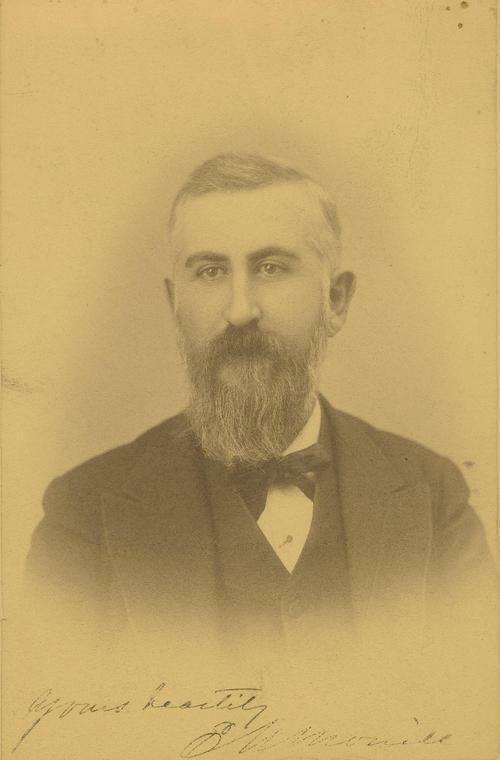 Edmund N. Morrill was born in Westbrook, Cumberland County, Maine, on February 12, 1834, to Rufus and Mary Webb Morrill. His father was a tradesman in the tanner and furrier works. He had one sister and one brother. He and attended common schools in his hometown and mastered the tanning and fur trade at an early age. He eventually graduated from Westbrook Seminary in 1855. Morrill had the instinctive quest for knowledge; he read and studied many subjects, especially those relating to education, religion, human rights, and public affairs. At age 21 he engaged in the nursery business with his partner, John W. Adams. He was also elected a member of the school board of Westbrook. In 1857 Morrill decided it was time for a life change; he moved 1,600 miles west to Brown County, Kansas Territory; an interesting time in history because the issue of slavery had not yet been settled. After surveying several parts of eastern Kansas, Edmund built his homestead on Walnut Creek in Hamlin Township of Brown County, near the present day village of Hamlin. There he built a sawmill that later burnt down in a ravaging drought fire. Politically, and morally, Morrill felt right about the free-state (antislavery) agenda looming on the horizon, and by October 1857, he was elected from Brown and Nemaha counties as a member of the first free-state legislature in the Kansas Territory. Morrill played a shadowy but conspicuous part in reversing the laws that were earlier enacted by the territorial legislature composed largely of non-resident men from Missouri. By January 1858 Morrill had made a mark for himself in the political arena and was elected a free-state member of the proposed legislature under the terms of the Lecompton Constitution; this body never met. He was one of the many “minds” that were determined to steer the ship of Kansas toward a free-state territory. Then came the drought stricken calamity of 1860. A famine that would horrify its pioneers of the day, and so devastating was the fire-causing drought, the mill owned by Morrill and his partner was burned to the ground. The famine impoverished many settlers for much of 1858 and 1859, and for up to three months going without food, other than green field corn for an occasional winter corn meal. With internal war erupting in the eastern half of the country, on October 5 1861, Edmund Morrill enlisted in the army at Fort Leavenworth, Kansas, and was assigned to Company C, Seventh Kansas Cavalry Regiment. His daily routine and attention to detail in his cavalry duties were so impressive that later led to increased command responsibility. He was quickly promoted to sergeant on October 10, 1861. On August 27, 1862, he was promoted to captain and commissary of subsistence. This appointment was made at the recommendation of Vice President Hannibal Hamlin, perhaps because Hamlin was also a native from Maine. This new responsibility came with a promotion to captain and Morrill was ordered to report to General Ulysses S. Grant at Corinth, Mississippi. Captain Morrill was charged with managing the large perishable and non-perishable stores at Forts Henry, Heiman, and Donelson in Tennessee. In January 1864, during the tactical planning stage of General William Tecumseh Sherman’s march toward Atlanta, Captain Morrill was dispatched to Clarksville, Tennessee, and ordered to procure several thousand pounds of beef, game, and flour for subsistence for Sherman’s army. In his duties as chief commissariat, Captain Morrill was responsible for millions of dollars worth of stores and supplies. His noble executive abilities did not pass without due recognition from the commanders under whom he served. On October 20, 1865, he was promoted to brevet major for meritorious service, and mustered out of the army. After the war Morrill returned to Brown County and the town of Hiawatha where he established his home and embarked in the mercantile business. He served as clerk of the district court of Brown County from 1866 to 1870 and county clerk from 1866 to 1873. In 1871 he founded the county's first bank, serving as its president from 1887 until his death. In 1872 and again in 1876 he was elected to the Kansas State Senate. In the last year of his second term as state senator, he was president pro tem of the senate and chairman of the ways and means committee. In that committee he forged a plan to stem a state financial crisis by changing the sessions of the legislature from annual to biennial, which also helped him raise the funds needed to build a new wing and a new center section for the Capitol building. Morrill was also successful in getting two railway lines to traverse Brown County. In the legislature Morrill was always at center stage for supporting state, education, and charitable institutions. His practical legislative example was typically known for his equilibrium and fairness in state government, while promoting temperance, good morals, education, and law. In 1876 Morrill wrote and published a historical record of Brown County and in 1882 he established the Free Public Library of Hiawatha, and simultaneously founding the first bank in Brown County. But his greatest contribution to humanity came in 1878 when he gave generously to suffering settlers in western Kansas by delivering enormous quantities of dry stores. All the while Morrill’s name appeared repeatedly in the press as the most able man for governor and for Congress. In 1882 the press elevated him forward for 48th Congress with singular unanimity. He did not support his own cause, but at the June state Republican Convention, he was nominated as congressman from the state at large along with three others and received 282 delegates. In fall 1882 a majority of about 40,000 elected him to Congress, running ahead of the ticket in about 20 counties. At the urging of his closest friends, Morrill was drawn to the nomination for governor in 1894. His vast popularity in the state ensured his election later that year, and he served one term. At 61 years of age, Governor Morrill was the oldest person elected to the office of Kansas governor to that time. He won with a respectable 188,322 votes to the incumbent Governor Lorenzo Dow Lewelling’s 148,697 votes. In 1896 Governor Morrill was re-nominated by the Republican State Convention but lost to the combined Democratic and People’s Parties candidate, John W. Leedy, by only 7,500 votes. During his two-year stint as governor, Morrill resided at the Copeland Hotel in Topeka, Kansas. After his defeat for reelection, he returned to his previous residence at Hiawatha, and as president of the Morrill and Janes Bank. Morrill also served as president of the First National Bank of Leavenworth, Kansas, and was later director of the Interstate National Bank of Kansas City, Kansas. He opened and directed a loan company in Atchison, Kansas, and an 880-acre apple orchard. Morrill, Kansas, in northwestern Brown County, was named after him. He served as president of the Kansas Historical Society in 1896. He died of natural causes on March 14, 1909, at San Antonio, Texas; he is buried in Mount Hope Cemetery, at Hiawatha.